Community Living Victoria: HOPE. HELP. HOME. On December 16, 1955, a group of dedicated parents founded what is now called Community Living Victoria (CLV). Today, as the largest non-profit community living service provider on Vancouver Island, Community Living Victoria provides a range of support services to children, youth and adults with intellectual disabilities and their families. Our work is guided by our values, experience and history and draws from strong roots in the community. Community Living Victoria recognizes the rights of everyone to have a full range of life choices, including access to education, affordable and appropriate housing, leisure options, gainful employment and participation in the community. A healthy community encourages the involvement of everyone. Community Living Victoria had a very successful survey from April 24 – 27th, 2017. We were proud to receive our 5th 3 year award, which extends our accredited status to 2020. Community Living Victoria supports people with intellectual disabilities together with their families, support networks and community by promoting their full citizenship. 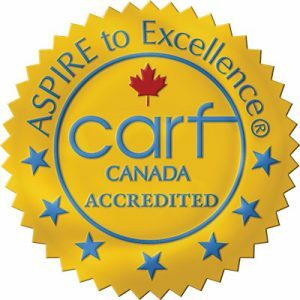 CLV received our fifth, 3-year accreditation award from CARF, extending our accredited status to 2020! You'll find lots of great information in the Family Support Newsletters this month. Visit our YouTube page where you can watch our Family Support FAQ videos.